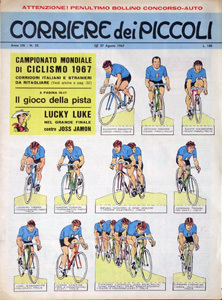 The "Corriere dei Piccoli" italian children's magazine offered a number of cycling games during the sixties, featured in the proper sections of this site. However, they also offered cut-up cyclists in at least a dozen occasions. Click to download a high quality scan of the 1959 Giro de Italia riders (pdf, 6.3 MB). Click to download a high quality scan of the 1959 Tour de France riders (pdf, 6.5 MB). Click to download a high quality scan of the 1963 Giro de Italia italian riders (pdf, 4 MB). Click to download a high quality scan of the 1964 Giro de Italia riders (pdf, 3.6 MB). Click to download a high quality scan of the 1964 Tour de France riders (pdf, 1.4 MB). Click to download a high quality scan of the 1965 Giro de Italia riders (pdf, 3.7 MB). Click to download a high quality scan of the 1965 world championship riders (pdf, 3.2 MB). Click to download a high quality scan of the 1966 Giro de Italia riders (pdf, 2.1 MB). 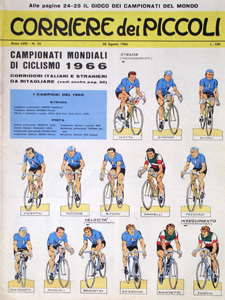 i) 1966, nº 35 (august 28th): Cyclists of the world championship. (2 sheets) Non-related "Il Vigorelli" game inside. Click to download a high quality scan of the 1966 world championship riders (pdf, 2 MB). Click to download a high quality scan of the 1967 Giro de Italia riders (pdf, 3.7 MB). k) 1967, nº 35 (august 27th). Cyclists of the world championship (2 sheets). Non-related game ""Il campionato del mondo di ciclismo" inside. 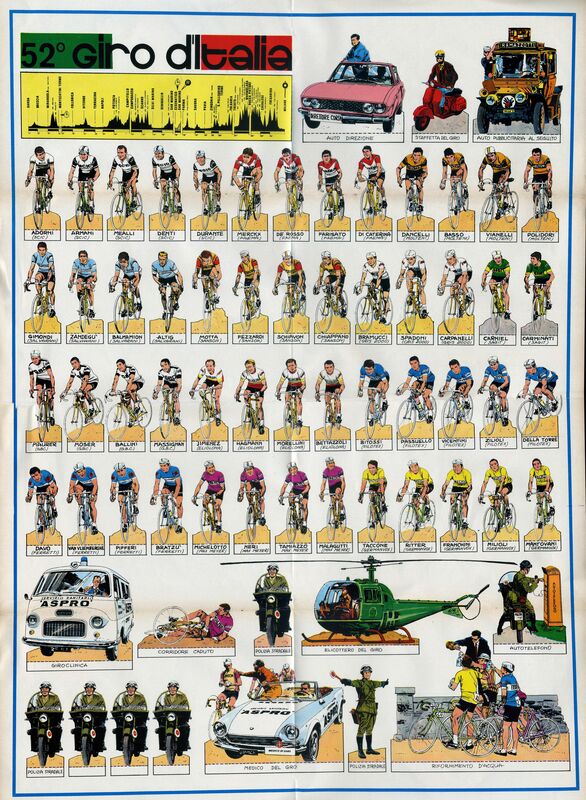 Click to download the poster of the 1969 Giro d'Italia (beware! 15 Mb). Click to download the booklet (pdf, 2.2 MB). Beware, if you are going to print the riders, the original size was almost A3. Unless you have an A3 printer available, you should print each page on two landscape-oriented A4 sheets). Of course this deos not apply to the poster (you will have to use your imagination to print that one) or the booklet.